Blood pressure is defined as the force exerted by blood as it pushes against the walls of your arteries. If this force is too high for a prolonged period, a condition known as hypertension—chronically high blood pressure—develops. Over time, the strain caused by hypertension will lead to damage among both the heart and your blood vessels, resulting in various coronary conditions. Although medication exists to control blood pressure, it’s also possible to supplement any medical treatment with certain dietary adjustments. One of particular interest would be the inclusion of more celery in your diet. One cup of chopped celery contains around 20 calories, 104 milligrams of sodium, eight milligrams of vitamin C, and 344 milligrams of potassium. Celery also contains substances like 3-n-butylphthalide, apigenin, flavonoids, and omega-6 fatty acid. These are organic chemicals that help control elevations in blood pressure. Unlike other fruits and vegetables, celery is readily available year-round, so you don’t need to worry about availability too much. Since some people might dislike the strong taste of celery—or have issues getting it out of their teeth or braces—it is also available in supplement or seed oil form. What Can Celery Do to Help? There are three primary sources that can increase blood pressure: a heightened volume of blood being pumped, resistance to flow in the arteries, and the narrowing of blood vessels. Celery has nutrients that aid in alleviating all of these in one form or another. Excess cholesterol will harden into plaque in the arteries and make them stiff and narrow. Cholesterol forms into plaque when it oxidizes. The butylphthalide oil in celery is a potent antioxidant that is capable of reducing the levels of bad cholesterol in the body. Additionally, it has been observed that two stalks of celery can lower a person’s cholesterol by up to seven percent. Inflammation is a notable cause of arterial blockages, as it makes the artery walls irregular and in some cases swollen. 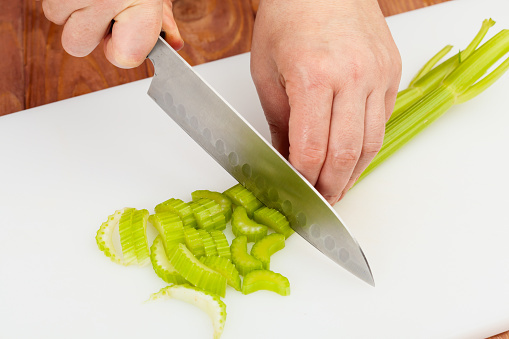 Along with apigenin, celery contains the flavonoid luteolin and both are capable of reducing inflammation. By soothing the arterial walls and smoothing out the muscle tissue, the risk of an obstruction developing is greatly reduced. Celery (the seeds in particular) is a diuretic. This means that it draws excess fluid from your body and makes you urinate more frequently. As mentioned, one of the causes of high blood pressure is an increased blood volume. When extra fluid is removed from the bloodstream, the volume—and pressure—of the flow decreases. 3-n-butylphthalide, sometimes known as NBP, is a vasodilator. It decreases resistance along your arteries and blood vessels, promoting blood flow and lowers blood pressure. Celery extract has been known to prevent stroke and promote blood flow in animal studies, mainly due to its mixture of vasodilatation, cholesterol-lowering, and diuretic effects. Additionally, a 2013 human trial showed noticeable blood pressure reductions in patients who took celery seed extract, further connecting the two. These results were also encouraging enough that a larger, double-blind study is currently being prepared for. While eating two stalks of celery a day is enough to get the full health benefit, there are other options available. So if you find the taste of raw celery unappealing or want to try some variety, there are many recipes available for customizing how you eat this veggie. This requires a juicer or similar equipment. Simply juice the ingredients, mix them together, and enjoy. You can mix and match other fruits and vegetables to your taste as well. 1. Clean and then thinly slice the celery. It should measure about three cups when firmly packed into a liquid measuring cup. Set aside. 2. Remove the zest (thin outer skin) in strips from half of the lemon. Crush the cardamom pods and pepper corns. 3. In a medium sauce pan, bring the water and sugar to a boil. Throw in the celery slices and let it boil for one more minute. Stir and then remove from the heat. 4. Add the lemon zest, pepper, and cardamom to the celery mixture. Stir to combine, then cover the pan and cool to room temperature. 5. Strain the celery syrup through a fine mesh strainer into a jar or other suitable storage container. Press the celery to extract as much syrup as possible. The candied celery is also rather tasty on its own. 6. Juice the lemon, and add three tablespoons of the juice to the syrup. Stir to combine. Store covered in the refrigerator until ready to use. 7. Mix syrup with seltzer water. A one-to-four dilution is a good starting point; adjust to your taste. Serve over ice with a tender inner celery stalk as garnish if desired. 1. Trim celery and cut into pieces to fit your jar. 2. Place onion slices, garlic, and dill in between the celery. 3. Cover with the brine solution to approximately one inch from the opening of the jar. 4. Close the jar. Don’t forget to fill the airlock and let it sit at room temperature for five to seven days or until bubble activity dies down. Move to cold storage. 1. Stew the celery and onion gently in the butter and oil in a covered pan for 10 minutes. 2. Add the potato and stir to coat well with butter and oil. Don’t let the vegetables brown. 3. Add the stock. Bring the soup to a boil and then reduce to a gentle simmer for 30 minutes or until the celery is very tender. 4. Blend or pass the soup through a mouli grater (utensil for grating). If the celery is particularly stringy, you might like to pass it through a sieve. 5. Taste and add salt and freshly ground black pepper as you see fit. Place the soup into bowls. Add a touch of double cream. “Brine Pickled Celery,” Pickle Me Too web site, March 23, 2012; http://www.picklemetoo.com/2012/03/23/brine-pickled-celery/. “Celery Soda Recipe,” Food52 web site, March 11, 2012, http://food52.com/recipes/16516-celery-soda. Toole, M., “Celery for High Blood Pressure,” Healthy Holistic Living web site; http://www.healthy-holistic-living.com/foods-that-lower-blood-pressure.html, last accessed October 7, 2015. “High Blood Pressure (hypertension),” Mayo Clinic web site, July 7, 2015; http://www.mayoclinic.org/diseases-conditions/high-blood-pressure/basics/definition/con-20019580. Hornby, S., “Does Celery Lower High Blood Pressure?” Livestrong.com, December 18, 2013; http://www.livestrong.com/article/503827-does-celery-lower-high-blood-pressure/. Madhavi, D. et al., “A Pilot Study to Evaluate the Antihypertensive Effect of a Celery Extract in Mild to Moderate Hypertensive Patients,” Natural Medicine Journal 2013; 5(4). Roddy, R., “Avoid Embellishments,” Rachel Eats web site, January 3, 2013; https://racheleats.wordpress.com/2013/01/03/avoid-embellishments/.